You don’t have to be a celebrity to walk the red carpet or to afford a property in the picture-perfect Liguria region. Approaching Liguria from the sea the villages look like beautiful film sets. 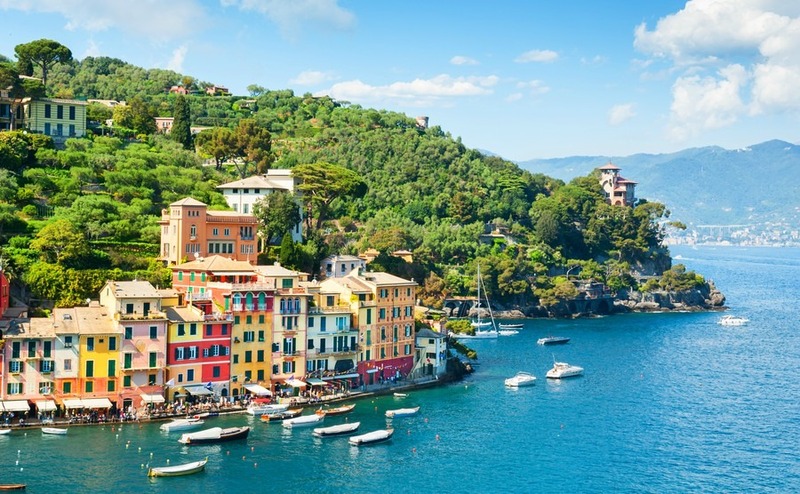 It’s easy to see why it is one of the most popular holiday destinations for the rich and famous, particularly Portofino. Who wouldn’t love to sail a yacht along the coast, stopping off at pretty villages with pastel-coloured houses of pink, orange and blue, clinging to the craggy cliffs above pretty bays with fishing boats bobbing around on the clear waters. If you don’t have a yacht you can enjoy the same views from a ferry or pleasure boat. Across the Liguria region you can enjoy nature, mountains, culture and events, in quant little villages and large port towns. In the 18th and 19th centuries, British and northern European aristocrats, as well as famous artists and poets, began visiting Liguria and the likes of Byron and Shelley even stayed a while. In more recent years actors and pop singers such as Leonardo DiCaprio, Kylie Minogue and Rihanna have been spotted here. If you have dreamt of walking the red carpet, you can now walk on the longest one in the world, right here in Liguria. 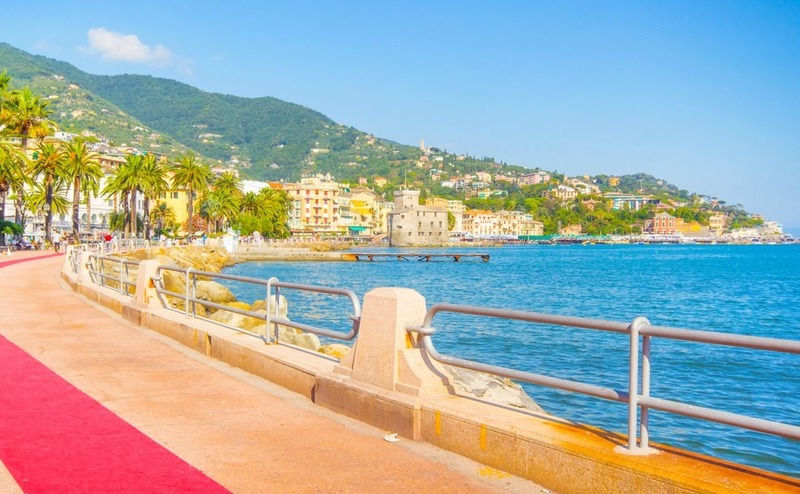 Launched this spring the red carpet currently runs between Rapallo and Portofino, but is planned to be extended further, the aim is to symbolically connect the many beautiful areas of the region. Liguria is in north-western Italy, bordering France and the Italian regions of Piedmont, Emilia-Romagna and Tuscany, making it very convenient for transport links. Once you have got across the English Channel by Eurotunnel or ferry, it is then about a 12-hour drive down through France. The most convenient airports for Liguria are Genoa, Pisa and Nice (France). For example, Ryanair runs flights from Stansted to Genoa from Monday to Saturday. Good train services run all along the coastline, and buses connect the smaller villages. Although, most people prefer to explore the region by car or take a ferry or boat trip along the coast. Liguria has a rocky coastline with small hidden coves, beaches and pretty seaside villages perched on the cliffs above tiny ports. Five of these villages are Corniglia, Manarola, Monterosso al Mare, Riomaggiore and Vernazza, which have become very popular with tourists, and known collectively as the Cinque Terre. But, the whole Ligurian coastline has so much to offer visitors and homeowners alike. Stretching 300 kilometres from Ventimiglia to Ameglia the Ligurian coast also boasts the Gulf of Poets, the Gulf of Tigullio, Genoa, the Paradise Gulf, the Riviera delle Palme and the Riviera dei Fiori. The coastal areas are sheltered by the mountains and you will see terraces supported by dry stone walls covered in vineyards and olive groves, and extensive woods with centuries old trees. Across the Liguria region you can enjoy nature, mountains, culture and events in quaint little villages and large port towns. The Ligurian coast between Cinque Terre and Portovenere along with the islands of Palmaria, Tino and Tinetto, offer great scenic and cultural value and have been recognised as a World Heritage Site by UNESCO. Also included is “Strade Nuove” in Genoa’s historic centre. The Palazzi dei Rolli (Palaces) date from the late 16th and early 17th centuries, when the Republic of Genoa was at the height of its financial and seafaring power. For those who enjoy walking in the great outdoors there are coastal paths and inland mountain trails, valleys, streams and lakes to explore. Liguria offers many events, festivals and fairs. The most famous, which is televised across Italy, is the San Remo Music Festival, which attracts famous Italian singers and new talent. Genoa has one of the most impressive marine life centres in Europe. The Aquarium was designed by famous Italian architect Renzo Piano and is amazing inside and out. The city also hosts the world renowned International Boat Show, which gathers the most important exhibitors from across the world. 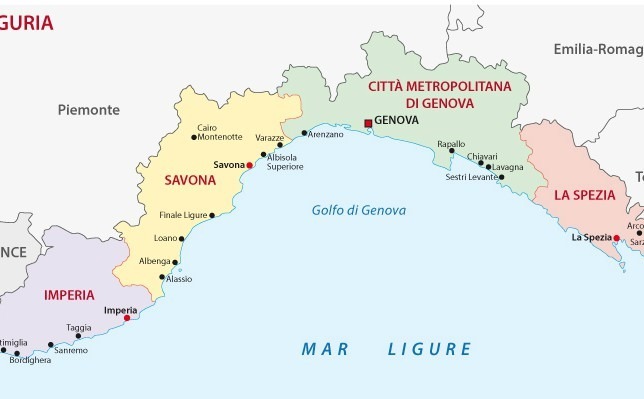 The provinces of the region are: Imperia, Savona, Genoa, and La Spezia. Famous tourist resorts include: Portofino, Santa Margherita Ligure, Rapallo, Sestri Levante with its enchanting Baia del Silenzio (Silent Bay), and Chiavari. Most Beautiful Villages: Framura, Seborga, Zucarello, Vernazza, Varese ligure, Triora, Noli, Montemarcello, Millesimo, Lingueglietta, Laigueglia, Finalborgo, Colletta di Castelbianco, Cervo, Castelvecchio di Rocca Barbena, Campo Ligure, Brugnato, Verezzi, Apricale. A description of each of these villages can be found here. Regional Capital: Genoa (Genova), combines the ancient with the modern, with culture, food and buildings that are greatly influenced by its maritime history and seaside location. Taking a stroll through the alleyways of the old town you will find Renaissance and Baroque palaces and sea food restaurants. Sanremo, the city of flowers, famous for the Italian Music Festival and for its old casino building. Bordighera and Alassio, with its three kilometres of fine sand. Laigueglia and Varigotti, some of the gems embedded in the Riviera di Ponente. Lerici, with its Medieval castle, elegant villas and lush gardens. The star of Ligurian cuisine is Pesto Genovese, that delicious pasta sauce made with basil, pine nuts, garlic, parmesan, pecorino and extra-virgin olive oil. Popular along the coast are seafood dishes including fish soups and stuffed and fried sardines. Stuffed veal, foccacia and Easter Pie are other dishes not to be missed. If you buy one of the well-priced country properties, you may even be able to enjoy olive oil and wine produced from your own land. The star of Ligurian cuisine is Pesto Genovese, that delicious pasta sauce made with basil, pine nuts, garlic, parmesan, pecorino and extra-virgin olive oil. 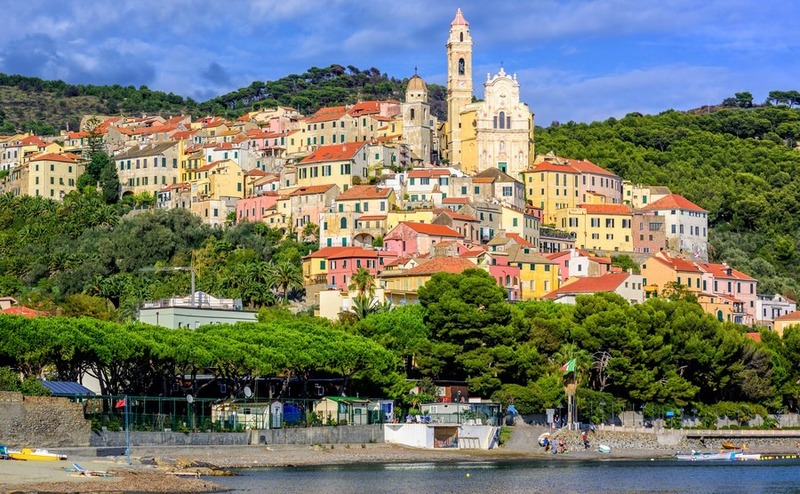 Much of Liguria has avoided modern development and there are numerous small towns and villages that have kept their Italian charm, despite the number of visitors. Traditions in both style of property and lifestyle are maintained and the atmosphere is very relaxed, making Liguria a lovely place to retire. The region has a mild climate, with summer temperatures reaching a comfortable 27° and midwinter highs of around 12°. For the energetic there are many activities to enjoy in the countryside and on the sea. There may even be opportunities to start up your own business related to sailing, scuba diving, horse riding, hiking and cycling. The region has a wide range of property on offer including luxury villas, farmhouses, village houses and apartments. For under €100,000 you can find inland apartments, small houses, rural properties and houses needing renovation. As always, the nearer you get to the coast the higher the prices. If you plan on renting out the property you will also find that a sea view will result in a greater rental income and in the top resorts there will be no shortage of tourists wanting to book. Properties right on the seafront don’t come up for sale very often, especially ones to renovate, so when they do they need to be snapped up quickly, particularly in the Cinque Terre and Portofino, which are very popular and expensive. For more affordable coastal properties try along the coast between Imperia and Genoa. The Imperia province appears to have the most properties available to buy and there are even properties 20 minutes from the coast for under €60,000. The Imperia province appears to have the most properties available to buy and there are even properties 20 minutes from the coast for under €60,000. For year-round living it may be desirable to live within easy driving distance of one of the larger towns, such as San Remo, Imperia, Albenga, Savona, Genoa or La Spezia for more facilities such as shops, hospitals, schools etc. 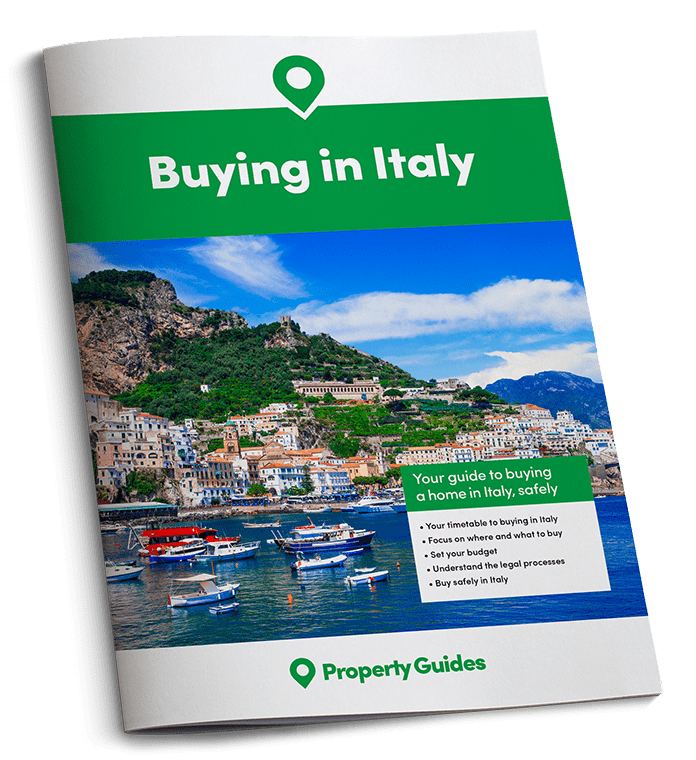 If you are ready to buy in Italy, you’ll have a few financial matters to sort out. For advice on getting the best currency deal download the Property Buyer’s Guide to Currency. La Spezia property: Here are two examples of what you can get by moving along the coast or inland from the main resorts. Take a look at the sea views from this two-bedroom house in a hamlet near La Spezia priced at €270,000. Or how about this town house in the village of Tellaro, clinging to a rocky peninsula on the Gulf of Poets, €280,000. Compare those to this one-bedroom apartment on the seafront of the more touristy Portovenere, costing €348,000. For more properties in La Spezia click here. For more information about visiting Liguria see the Official Tourism website La Mia Liguria.